Sakura Hayama Lager is a 5% pilsner from Sakura Brewery, based in Iwate, Japan. It’s part of their all-year round line up and can be bound in both bottles and on tap across Japan. To get around the happoshu beer licensing laws, Sakura Hayama contains 98% malts with adjuncts such as coriander being used to ensure that Sakura Hayama Lager comes in under the limit, and it also uses locally sourced fresh mountain spring water. At the time of writing, it’s unknown what other ingredients are used in Sakura Hayama Lager. Better than the Sakura Mayflower IPA but then that wasn’t hard. After having the dreadful Sakura Mayflower IPA [link], I was dreading Sakura Hayama Lager as much as I was dreading the Virgo Beers I had in the fridge. It’s come to that time of year in BeerTengoku when Joe and myself disappear off for a month of so to recuperate and also means emptying the fridges of beer – usually the ones that we’ve waited until last, mainly because we’ve been burnt by other offerings from the same brewery in the past. Sakura Hayama Lager poured out a hazy dark golden brown colour with a light frothy head on top. There wasn’t any yeast in the body so the haze is part of the chilling process that was either not filtered or deliberately left in. It had a slightly buttery aroma but coriander? In a pilsner? Um, was weird to say the least – not unpleasant weird but just weird in that it wasn’t really expected, as I thought it would just be a slight handful of coriander thrown in. 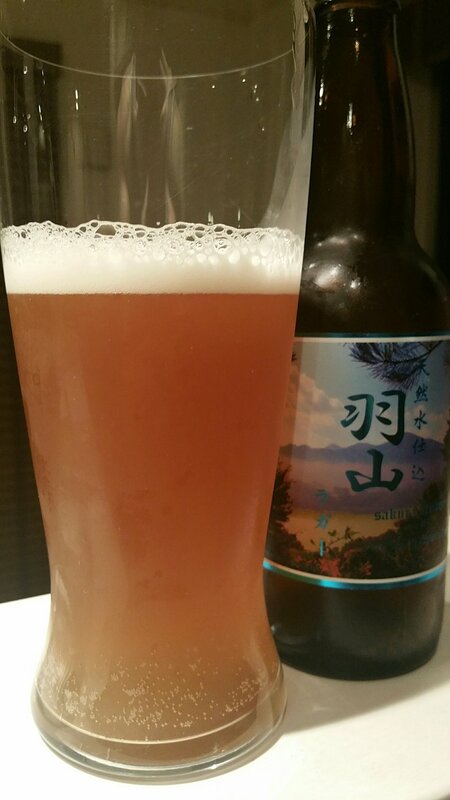 The buttery aroma though got stronger as Sakura Hayama Lager warmed up – not really something I enjoy. I was expecting Sakura Hayama Lager to be like every other pilsner in Japan – sweet and crisp with not much hop flavour or bitterness. I was kind of right. There wasn’t much hop flavour or bitterness, but nor was it sweet or crisp. Sakura Hayama Lager’s buttery aroma was present in the body and really didn’t suit the style at all. Horrors of the IPA came flooding back and I found myself struggling to finish off Sakura Hayama Lager. I persevered but at the end I couldn’t take it much longer – and grabbed an Aooni IPA to wash away the taste. This bottle cost me ¥700 or thereabouts. Just go buy three cans of Ebisu or Kirin Ichiban instead. Honestly, that IPA was horrid. Infected sink pour – at least the bottle I shared. I’ve had three of their beers, all contenders for worst beer in Japan, I’m afraid. I’m not alone in that opinion, some of the more respected and experienced opinions in craft (not me, obviously!) over here think the same way. People with palates and who will say if something is not right. I hear the brewer is a nice bloke and have had contact online with him but man oh man, nice people don’t always make nice beer. I have also heard that his beer on tap is not bad but I’m beginning to doubt the accuracy of that report, as the person concerned often puts a friendly, positive spin on things. I hope it’s just the bottles but then why would that be the case? Another new brewery not really knowing what they are doing? Japan has enough of those already. If Sakura wants to survive, they have to improve, else I don’t see anyone ordering their bottles a second time. The danger is of course that first timers might think this is what Japanese craft tastes like and the result being they do as you suggested, go back to the macro lagers. Much cheaper and much better than this. Hopeful for better beer from this brewery. Chuwyboy, thanks for the comment. Their IPA review is coming up soon – thinking of doing a month of bad Japanese craft beers – something different I guess. Geez. Be gentle. Like I said, I do hope Sakura gets better. But off to a bad start so far.